Stress fracture of the femoral neck is rare and often initially missed. A high index of clinical suspicion is required in athletes presenting with a history of insidious onset, exertional groin pain and pain at the extremes of hip motion on examination. Regular review is recommended to prevent progression of the stress fracture to a displaced fracture, as this significantly worsens long term outcome. A 55 year old man had been training for the London marathon by running about 40 miles a week for the preceding four months. Two weeks before the marathon, he noticed some discomfort in the right groin and presented to his general practitioner, who diagnosed a groin sprain and prescribed non-steroidal anti-inflammatory drugs. This eased the symptoms. On the day of the marathon, 2 miles into the run he developed aching and discomfort again in the right groin, but was able to run for a further 3 miles and walk for a further 7 miles before the pain increased to an intensity that made him withdraw from the race. He presented to the accident and emergency department of a major London teaching hospital. No radiographs were taken and he was discharged without walking aids, but with further non-steroidal anti-inflammatory drugs and a presumptive diagnosis of recurrent groin sprain. No local follow up was arranged. Over the next eight weeks, the discomfort in the right groin persisted despite continued non-steroidal anti-inflammatory medication and abstinence from running. He consulted a physiotherapist who, after a one week course of physiotherapy, referred him to our orthopaedic department. Examination showed 2 cm of shortening of the right leg and painful restrictions of movement of the right hip in all planes. Radiographs of the right hip showed a displaced basocervical fracture of the right femoral neck, which had collapsed into varus, with a neck shaft angle of 110° (fig 1). Early callus formation was present. There was no radiographic evidence of any pathological bony lesion at the site of the fracture, and serum biochemistry excluded any metabolic bone disease. The patient underwent closed reduction and fracture stabilisation using a dynamic hip screw and four hole 135° plate. Subsequent dual energy x ray absorptiometry excluded osteoporosis. Displaced basocervical fracture of right hip with varus collapse. Early callus formation is present medially. Stress fractures in joggers are relatively common. Although the metatarsals and tibia are the most commonly affected sites, an estimated 1% of stress fractures occur at the femoral neck.1 Early diagnosis can be difficult as both the symptoms of insidious onset exertional groin or anterior thigh pain and the early signs of mild pain at the extremes of hip motion are non-specific and subtle and therefore the diagnosis requires a high index of clinical suspicion. Often initial radiographs are normal. Differential diagnoses include groin strain, inguinal hernia, osteoid osteoma, osteomyelitis, and osteosarcoma. Although most femoral neck fractures are undisplaced at presentation,2,3 diagnostic delay is common3–5; Johansson et al5 reported an average diagnostic delay of 14 weeks. Unfortunately this can lead to displacement of an initially undisplaced fracture.5 In our case, no initial radiographs were taken and there was an eight week delay in diagnosis, by which time the fracture had displaced and collapsed into varus angulation (fig 1). As the symptoms and signs of early femoral neck stress fracture are non-specific and subtle, a high index of clinical suspicion should be maintained in all athletes. Early diagnosis is essential to prevent progression to a displaced fracture. 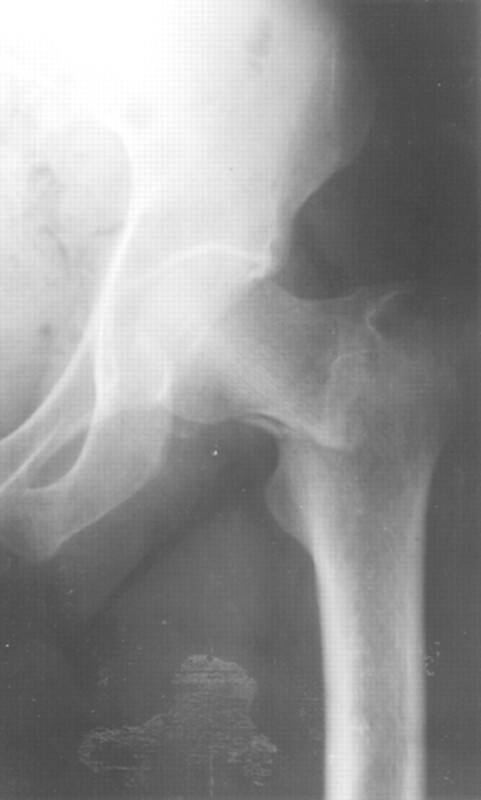 The aim is therefore early recognition to prevent progression to fracture displacement, as this significantly increases the risk of the devastating complication of avascular necrosis. Regular early review is recommended, and, if concern remains, a technetium-99m bone scan or magnetic resonance scan should be arranged. Ha KI, Hahn SH, Chung MY, et al. A clinical study of stress fractures in sports activities. Orthopaedics1991;14:1089–95. Clement DB, Amman W, Taunton JE, et al. Exercise induced stress injuries to the femur. Int J Sports Med1993;14:347–52. Kupke MJ, Kahler DM, Lorenzoni MH, et al. Stress fracture of the femoral neck in a long distance runner: biomechanical aspects. J Emerg Med1993;11:587–91. Kerr PS, Johnson DP. Displaced femoral neck stress fracture in a marathon runner. Injury1995;26:491–3. Johansson C, Ekenman I, Tornkvist H, et al. Stress fractures of the femoral neck in athletes. The consequences of a delay in diagnosis. Am J Sports Med1990;18:524–8.